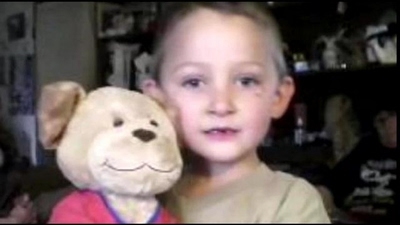 It’s been four days since 5-year-old Landon Robbins was found dead inside a Rhea County home. Two suspects have been charged in connection with Landon’s death. 5-year-old Landon Robbins’ mom and her boyfriend were charged with aggravated child abuse over the weekend, but Tuesday officials said they had enough evidence to hand down a felony first degree murder charge on both. Veteran Rhea County detectives say this is the worst case of child abuse they’ve seen. “There’s just no telling what he went through. He was just a big bruise,” Landon’s grandfather Jerry Wells said. “I really had plans to love him,” Landon’s biological father Gerald Wells said. Landon’s biological dad and granddad live in the Knoxville area. They’re struggling to understand why his life was taken Friday. “He was the most precious kid,” Jerry Wells said. Landon lived in Spring City in his mom, 24-year-old Jessica Robbins’, custody. They’d just moved into a camper with her year-long boyfriend, 22-year-old Bradley Adcox, a few weeks ago. Friday afternoon, she called 911 saying Landon wasn’t breathing. First responders found him lying on a make-shift bed in the living room. “She had said the young child had had a backyard accident the night before,” Rhea County Detective Rocky Potter said. But investigators say he had too many injuries that were not consistent with the “playing accident” story the couple described in interviews over the weekend. They first charged them with aggravated child abuse, but Tuesday said there’s enough evidence to charge both with first degree murder. The preliminary autopsy lists multiple blunt force trauma as the cause of the death. “We haven’t had anything like this though. I’ve been child abuse investigator since Sheriff Neal took over in 2002, and this is the worst one I’ve had to work,” Det. Potter said. Potter says this case is taking an emotional toll on the entire department. “We all have children,” Det. Potter said. “I just hope they see what they’ve done. I hope they open their eyes,” Gerald Wells said. Robbins also had custody of two other children, ages three and four, that also lived with Adcox. They were placed with family members. Investigators wouldn’t comment on if they also showed signs of abuse. The couple is being held in the Rhea County Jail with no bond. They’re scheduled for arraignment Friday. Landon’s family in Knoxville is planning a vigil in his memory that same day.